Karuizawa is a beautiful highland town situated at the foot of Mt. Asama. Cycling around the popular tourist destinations in Karuizawa is a good way to enjoy the nice, cool, pleasant breeze. 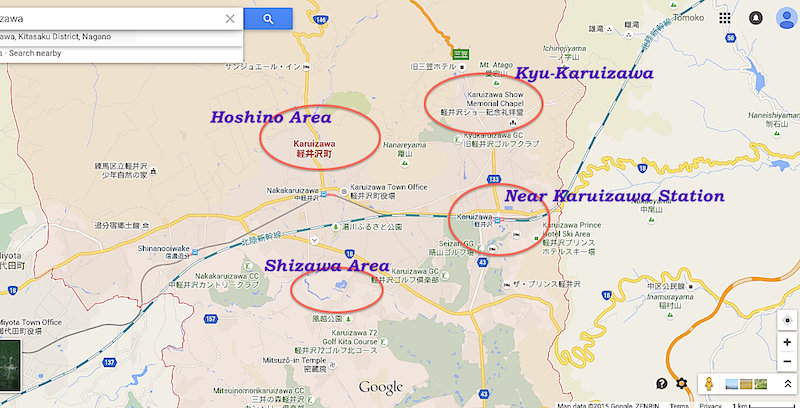 There are a few rental bike shops near JR Karuizawa Station (see below). They will give you a cycling map, some useful information about recommended destinations, nice restaurants, and whatever else you need. The places I reccomend are listed below. Click on the titles to watch a video. Although it’s chilly in the morning and evening, Karuizawa in the daytime in late September is mild, at around 20 degrees centigrade. We rented bicycles near JR Karuizawa Station, and went up north to the intersection of “Shinonome”（東雲). Then we turned left and rode our bicycles fast. The road was nice and straight and went through a beautiful forest. It was really refreshing. It took about 10 minutes from the station area to Roppon Tsuji (六本辻). At this point, six streets cross. Kumoba Pond is just a few seconds from there. This narrow pond has a circling path that is a 20-minute-walk course. There is also a big parking lot near there. We visited Kumoba Pond on Autumn Equinox Day; Japanese maples had just started their showing their fall hues. Ducks were swimming and nibbling at things in the water. The sunlight filtered down through the trees and warmed me. Leaves were swaying in the gentle breeze. Manpei Hotel is one of the few remaining elegant classic hotels in Japan. John Lennon stayed at this hotel with his family as a summer retreat. Starting in 1976, he enjoyed summer vacations here for four consecutive years. Their room was always #128. The hotel museum exhibits a hotel piano he played during his stays. By the way, Manpei Hotel is the first hotel that offered the Western style service in Karuizawa. In 1886 A.C. Shaw (a British Missionary), stopped by Karuizawa by chance. He really loved this place and asked for a room to the owner of an inn. The owner, Sato Manpei, thought it might be a good chance to start a new business for foreign customers. He studied Western customs and eventually opened this hotel in 1894. The hotel museum also displays various items that show the hotel's history. Autumn leaves in Karuizawa are at their best in late October to early November. I enjoyed a bike ride and stopped by Manpei Hotel, going through a beautiful forest colored with autumn tints. Today, Karuizawa is one of Japan's most popular summer resort areas, situated at the foot of Mt. Asama. But amazingly, nobody realized how beautiful it was until around 130 years ago. In 1885, an Anglican missionary, Alexander Croft Shaw (1846-1902), passed through Karizawa and found it to be a fine summer retreat. Soon he had a cottage built to enjoy the comfortable highland breeze; a wonderful escape from the hot, humid, Tokyo weather. His cottage was simple, yet functional. Its most noteworthy point was that it was not blocked from the street in any way. It was open and welcoming. Shaw tried to develop a good relationship with the locals. Shaw Memorial Chapel and Shaw Memorial House show this, and so way of building became the most common style in the town. Shaw was the first foreigner to build a summer cottage in Karuizawa. He fell in love with the beautiful highlands and started to bring his family here from Tokyo in 1886. They enjoyed long summer vacations every year here from then on. He told everybody who would listen that Karuizawa was a beautiful town and that its mild climate extremely comfortable in summer. At first, foreign residents of Tokyo joined him. And then Japanese noble people, high-ranking politicians, and business executives came and began to spend their summers here, as well. Walking through the popular “Church Street” shopping mall on Kyu-karuizawa's Main Street, you come upon the St. Paul Catholic Church. One day on a beautiful autumn morning, I witnessed a couple getting married here. As I watched, a colorful leaf fluttered down onto the train of the bride's beautiful white wedding dress. St. Paul Catholic Church was established in 1935 by French people living in Karuizawa, along with the efforts and donations of other Catholic believers. Amongst them, Czech American architect, Antonin Raymond, and his artisan wife French-American Noemi (both devout followers), worked together for the construction of the building and its ornamentation. The former Mikasa Hotel, located at the foot of Mt. Asama in Nagano, was once a fashionable social gathering parlor. In 1886, a Canadian-born British missionary, A. C. Shaw, visited Karuizawa unexpectedly and immediately fell in love with it. He and his family, accompanied by his friends, spent the whole summer there. After that, Karuizawa became (and still is) a popular summer resort for foreign residents, Japanese business executives who have lived abroad, and even the Imperial Family and other noble people. The high class Mikasa Hotel was born to the satisfaction of such 'high-level' people. The number of rooms totaled only 30 and the hotel was equipped with a swimming pool, flush toilets, beautiful chandeliers lit by electricity, and other extravagant interior touches that decorated each room. The hotel even offered its guests a deluxe horse-drawn carriage service from Karuizawa Station to the hotel! Hoshinoya Karuizawa, one of the highest quality resorts in Japan, has 77 guest rooms in a small, newly created village. Rooms are arranged in lines along a pure stream running through a valley between hills. Guests are picked up at the gate, driven to reception, and are then checked in at a room where mysterious music comes floating up from the floor and fills your senses. After being served a cup of tea, a staff guide drives you to your room in the village. You move from your daily life into their unique world. During this process, you will unconsciously pass through several barriers they have consciously set up. Inside the village, you feel you are a visitor on the first day, then feel like a resident on the second day, and eventually feel that you are a villager who has been living here for a long time! Your room, without TV and newspapers, provides a perfect time for relaxing. Enjoying a spa, reading books on a big sofa at the library, and just idling the day away are all you need to do! They also offer some activities, such as Eco Tours, bird watching, and various seasonal events like moon viewing. We got up early and had a nice walk in the morning, then went out and spent time outside the village on bicycles. We came back to the village in the afternoon, and then relaxed at the spa and library. Karuizawa Kogen Church is a 5-minute-drive north along Route 146, from Naka-Karuizawa Station on the Shinano Tetsudo (Line). The church, surrounded by beautiful greenery, is one of the most popular tourist attractions in Karuizawa. But it was not a church at the beginning. In 1921, Christian evangelist, Uchimura Kanzo (1861-1930) named a small lecture hall “Hoshino Yugaku-do” as a place of learning and enjoyment. A lot of highly educated people gathered here and had passionate talks about art and literature. After WWII, the lecture hall changed its name to Karuizawa Kogen Church. Today, it is not only a place for worship, but also a place where concerts and weddings are held. Hoshino Hot Springs, Wild Bird Sanctuary, and other activities are nearby. Many couples marry in this church during holidays. When I was here, a minister was talking to the bride in her wedding dress in front of the church door. The scene took place in the midst of beautiful fresh greenery. Parents and friends were waiting for her appearance patiently inside the door. Stone Church in Karuizawa was built in commemoration of Uchimura Kanzo (1861-1930) who was the foremost leader of the Non-church Movement, Japanese author, and Christian evangelist. The church is only 20+ years old, but it looks like it has been here from the ancient days. The building, designed by an American architect, Kendrick Kellogg (1934-), integrates its surroundings naturally. Kellogg was careful to make sure that the building would not change the surroundings: air flow, water stream, and the slope of the land. When I first visited here in around 1990, I was touched and very impressed with this novel design. I felt that the building looked futuristic but also very primitive. Kellogg's concept was that the repetition of stone and glass arches would symbolize male and female, bride and groom. At the ground level is a chapel, and below that is a memorial hall of Uchimura Kanzo. The Hoshino Resorts area in Karuizawa is a gorgeous highland resort that includes hot springs, hotels, churches and restaurants. Hotel Bleston Court is in the center of the complex. Couples who get married have a wedding party and stay there with family and friends. They enjoy a luxurious time together. Many people also spend time in Karuizawa in autumn and even winter, as well as from spring to summer. That is because beautiful autumn leaves, hot springs at the foot of Mt. Asama, and a mystical snowscape can all be enjoyed. When I was at the lounge café of the hotel, lots of guests were waiting for their wedding party. The sofa at the open terrace was quite comfortable. I relaxed and sipped a nice hot coffee, viewing colorful autumn leaves and listening to them rustling in the breeze. Karuizawa in late September was at a calm, peaceful, and comfortable time after the din of summer. Sezon Museum of Modern Art sits in a forest, and was actually designed as a “Museum in deep green.” We pedaled our bicycles up a gentle slope in the woody area heading north for 30 minutes from Naka-Karuizawa, and finally reached the gate of this museum. After passing the gate, we walked through a beautiful forest. It was nice and refreshing. The murmur of a small stream in the museum garden, and the sound from the leaves rustling in the wind, were comfortable to our ears. The temperature was lower than 10 degree centigrade in the morning and the autumn leaves had just started to turn. We had a pleasant time sitting at the open-air terrace of the museum café. Japan Silhouette features beautiful things, touching scenery, and interesting buildings of historical importance—I would like to guide you to many such places through my articles. Please enjoy all “things Japanese” together with me. Copyright© Japan Silhouette. all right reserved.